A guide from Far and Wild Safaris will collect you after your breakfast from your hotel or from the King Shaka International Airport in Durban and travel along the scenic Dolphin Coast and into rural Zululand, arriving in time for lunch in St. Lucia. We will check into our lodge and then visit the eastern shores of Lake St. Lucia, heading to Cape Vidal, game viewing all the while. After a visit to the beach we would continue on the circular route for a game drive before returning to our lodge. 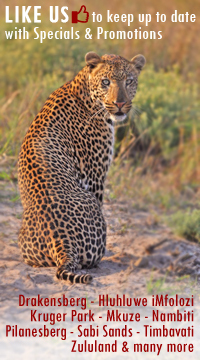 Animals that may be seen here include kudu, reedbuck, zebra, waterbuck and other antelope species, black and white rhino, elephant and on the odd occasion, leopard. After our two-hour cruise and lunch we make our way to the Hluhluwe uMfolozi Park where we would spend two nights at Hilltop Camp. The accommodation here is in a brick under thatch chalet, each bedroom with its own private bathroom/wash-basin and toilet. Each chalet is also equipped with a fridge.